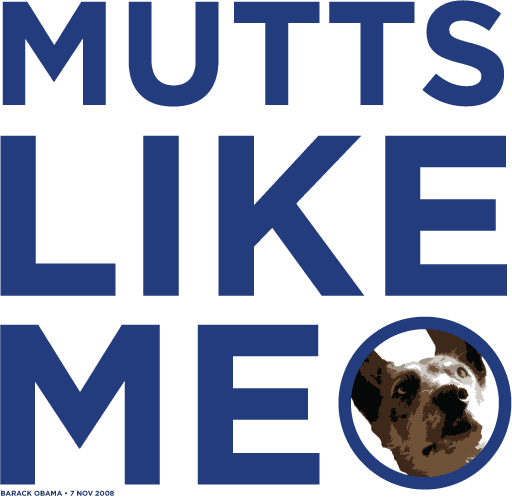 In an his first press briefing as president-elect, Barack Obama referred to shelter dogs as “mutts like me.” Apart from the bracing self-deprecation, that offhand remark resonates for many Americans, who consider themselves mutts and are proud of it. Indeed, in a melting-pot society, what could be more American than being a mutt? There’s some sublime conceptual jiu-jiutsu in this phrase. The enlightened position is that race is a cultural construction. We know that there is more genetic diversity among the members of one race than between races, and the lines separating one race from another are arbitrary. For America’s first black president and first biracial president—the fact that both of these are valid statements reinforces the arbitrariness of race—to identify himself in this way turns his race, which could be a point of division, into a point of commonality. I like that. I decided it should be on T-shirts. And now it is. Go get yourself one. The text is set in Gotham, the typeface used in Obama’s campaign materials. The dog is Suki, and I worked up the image from a photo taken by my friend and his person, Casey.